Robot’s inverse kinematics is more complicated issue than robot’s forward kinematics. First robot’s forward kinematics must be solved because it is a part of inverse kinematics. 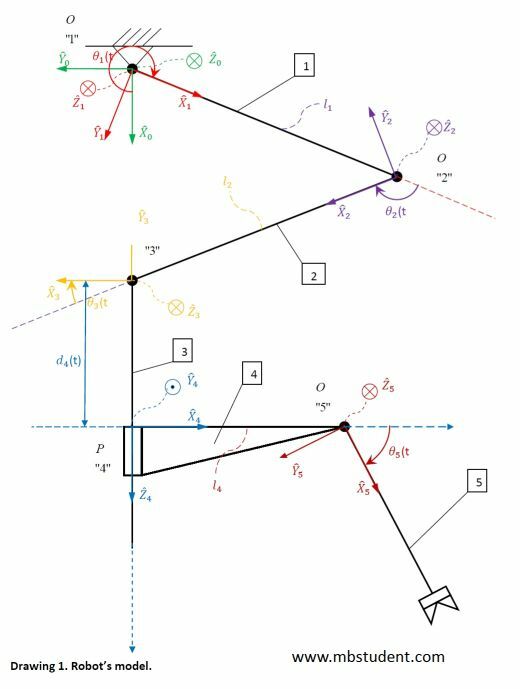 In inverse kinematics Cartesian coordinates values of set position are known. Robot’s motion trajectory is known. In inverse kinematics find values for joint drives angles or joint drives linear shifts in function of time have to found. Positions and trajectories are known. Purpose of inverse kinematics is to know how to control robot drives to let them achieve setpoint trajectory. Complete solution of robot’s inverse kinematics. Elaboration in project contains solved forward kinematics, inverse kinematics, static analysis and code for simulation in MATLAB program. Robot’s model, which is analyzed in this project, has five drive where three of them are angular drives and two of them are linear drives.